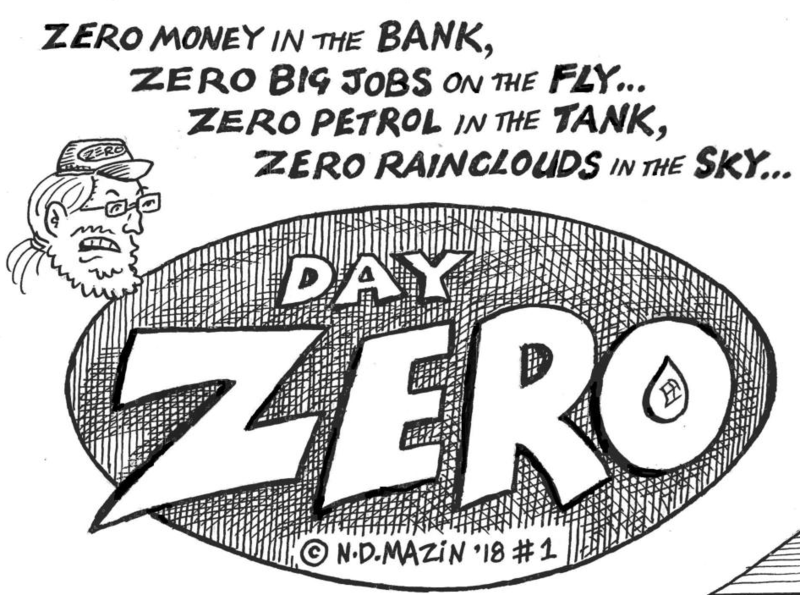 Veteran underground cartoonist N.D. MAZIN pokes his head above the parapet with a new online comic, DAY ZERO, his first foray into the public space for quite a while. “It was all that mucking about with grey water and bucket flushes that did it”, he says. Mazin says his new strip “covers the concatenation of concurrent catastrophes that is laconically referred to as ‘news’, as if all this unbelievable craziness we have to endure was perfectly normal”. It begins with the Cape Town water crisis, but he warns that it will soon be “zooming in and out of history, geography, palaeontology, science, science fiction, fantasy, satire, politics and philosophy, ricochetting between Surfer’s Corner and the rest of the universe(s)”. N.D. Mazin (Andy Mason) is possibly South Africa’s longest serving underground cartoonist, having evaded regular publication in a reputable periodical for four decades. Since his Vittoke in Azania student comics of the late ‘70s, he’s self-published countless comix and ‘zines, including PAX (Pre-Azanian Comix), Mamba Comix, Azaniamania and The Legend of Blue Mamba. He’s also written a critical history of SA cartooning, What’s So Funny? Check him out at www.ndmazin.co.za.